In 1974, the first major Imaro story was published in Dark Fantasy magazine in the US. 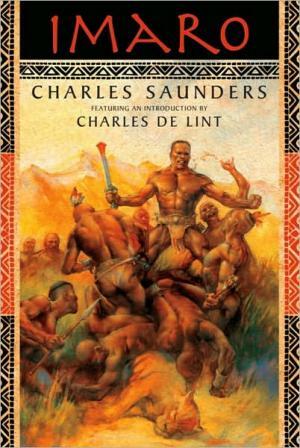 The author, Charles Saunders, had loved fantasy for years, but realized that he could no longer deal with the racism and lack of African characters; so he wrote his own. It was the height of action adventure with Robert Howard’s Conan being a favorite of Saunders’. Imaro, however, stood out not only for being African, but also for the excellence of Saunders’ writing. After many short stories (including one in the first edition of The Year’s Best Fantasy Stories) and three novels, Charles Saunders moved into other fields. In 2003, a rabid fan from Australia got hold of Saunders and begged for more stories. Saunders had told publishers and fans alike that he couldn’t go back. Reality had intruded. One Imaro story from the 1970s, “Slaves of the Giant Kings,” had eerie similarities to the Rwandan massacre of 1994. Then he realized that writers can always have “do overs” and now there is a brand new Imaro novel, titled simply Imaro. Now there are new stories for fans who have been reading since 1974 and for new fans that weren’t reading anything then. These stories have the same pulse-pounding adventure that made fast action fantasy famous, but with a depth of plot and character development that sets them apart. There are no places where the plot breaks down or where the characters stop making sense. But this is the first in a series so don’t expect everything to be resolved. Imaro is one of those silent, powerful, haunted heroes whom so many of us secretly love. And all the rest of the characters, even the villains, are believable. Horrifically inhuman, but somehow still believable. That Kulu was dead, they would soon learn. But the loss was well atoned. For with him, Imaro carried half a dozen wrist-knives — still attached to the stumps of hands skewered on the blade of a captured spear. On the topmost hand, pale blotches showed through blood smears. Imaro travels across a continent bristling with the magic of many Gods and many varied cultures. All of them are based on real cultures and some of them might seem familiar. It can add another layer of interest as echoes of anthropology class appear in your head. He must fight his way through that continent to find out who or what wants him dead. Of course, there’s a beautiful woman involved whom he falls in love with, but she’s as tough as he is and probably smarter. This is a bit from their early meeting as Tanisha slips into Imaro’s tent and he grabs her. Imaro removed his hand. Tanisha’s mouth opened but only to take a gasping breath, not to scream. Then, with a subtle twist for which Imaro was not prepared, she turned her body to face the warrior — and her mouth found his. So the moral for writers and fans alike: never give up. If you loved Conan or Tarzan until you realized just how racist and badly written those stories were, then you need to read the good stuff.